The Bapska border crossing between Serbia and Croatia, one of the areas WHO visited recently to review services for refugees. Currently, large numbers of refugees and migrants are crossing Serbia by bus from the Preševo area in the south, to the north-western town of Sid, from where they take the Tovarnik or Bapska border crossings into Croatia. In recent days up to 2000 refugees and migrants have been travelling through Sid on a daily basis. The WHO Office in Serbia is working with national and local authorities, and supporting nongovernmental organizations, providing guidance on basic health services, and distributing medical supplies. Last week, the Head of the Country Office joined the Assistant Minister for Public Health and the Head of the Public Health Group at the Ministry of Health visiting several reception centres and health facilities in Serbia to evaluate and coordinate the provision of health services to refugees and migrants in transit across the country. The public health situation in the north-west of Serbia is monitored on a daily basis by the Public Health Institute in Sremska Mitrovica. Disease surveillance systems operate around the clock, and the Institute is part of the local crisis headquarters, which coordinates activities among partners including the Commissariat for Refugees, the Serbian Red Cross, the Ministry of the Interior and communal services and municipal authorities. WHO is supporting the Ministry of Health and local health authorities to coordinate the provision of services with NGOs. A medical doctor, a nurse and an epidemiologist from the health centre in Sid cover the medical needs of refugees and migrants, and a team from the emergency department is on call at night. These teams respond at the request of staff from the Commissariat for Refugees, who are always present in the field. Coordination and communication are working well, and in the past 7 days 170 interventions have been made to treat a range of health issues such as fatigue, wounds, injuries, and respiratory infections. During the visit, WHO distributed medical supplies for treating injuries, as well as syringes and needles, to the Institute and the health centre in Sid, and is procuring additional supplies and medicines. Serbian authorities have also converted a decommissioned hospital in Principovac into a reception centre to accommodate up to 250 refugees who need to rest and receive medical assistance. The medical team of a doctor, two nurses and a psychologist are working together with NGOs including the International Aid Network and the International Medical Corps, and the health centre in Sid. At the border crossings of Tovarnik and Bapska, basic services are provided by UNHCR, the Red Cross, Médecins Sans Frontières and the Danish Refugee Council. Local health institutions monitor and coordinate with nongovernmental organizations. A separate WHO/UNICEF expert team has recently visited several reception centres for refugees in Serbia to identify needs and provide recommendations and guidelines to national health authorities. Training for public health professionals to strengthen national capacity on migration-related nutrition issues will be conducted and policy papers developed. Inadequate nutrition can increase vulnerability to communicable and noncommunicable diseases, especially among older people and children. For infants, even in emergency situations the aim should be to create and sustain an environment that encourages frequent breastfeeding of children up to at least 2 years of age. Additional medicines and an ambulance are needed for the health centre in Sid, and a mobile medical clinic is needed for the Reception Centre in Principovac. Further focus and preparations are required to take account of possible acute respiratory diseases such as influenza in the coming colder season. 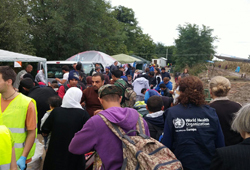 WHO will continue to support the Ministry of Health of Serbia to coordinate the overall health response to the large influx of migrants in the country.